The country’s energy is infectious and you’ll be mesmerised by cosmopolitan cities which overflow with eye-catching colonial and modernist architecture, by its music and dance and its rich culinary heritage. Welcome to Brazil where vibrant cultures meet hypnotic rhythms and where natural wonders range from beautiful coastlines and tropical forest to vast wetlands and thundering waterfalls. The country’s energy is infectious and you’ll be mesmerised by cosmopolitan cities which overflow with eye-catching colonial and modernist architecture, by its music and dance and its rich culinary heritage. On this journey visit vibrant São Paulo, explore the biodiverse Pantanal region, admire the work of Brazil’s leading architects and designers, savour the ethnic flavour of Salvador, bed down in the country’s leading hotels and dine out on the fresh flavours of Brazilian cuisine. A warm welcome to Brazil and the country’s dynamic econimic and cultural centre, one of the world’s largest cities. Your hotel is centrally located in the upscale Jardins district where boutique shops and fashionable restaurants abound. You’ll meet your Resident Tour Director this evening at a welcome briefing followed by dinner at the hotel’s rooftop restaurant SEEN. With 360-degree views of the city skyline you’ll be dished up award winning cuisine by the executive chef and drinks by head bartender. For your introduction to São Paulo head to the famous Ibirapuera urban park, a green oasis where Paulistanos flock to escape the commotion of the city. Oscar Niemeyer’s futuristic museum and Roberto Burle Marx’ landscape design make this one of the city’s most important attractions. Admire much more of the city’s architectural genius when visiting the oldest train station, the beautiful Estação da Luz, which was inaugurated in 1867, the Terraço Italia and Municipal Theatre in the old downtown area. Continue to the covered Belle Epoque-style Municipal Market to try a variety of different local dishes and soak up the atmosphere. The afternoon’s highlights include the São Paulo Metropolitan Cathedral, the neighbourhood of Liberdade which is home to the largest Japanese community outside of Japan and on the way back to the hotel drive down famous Paulista Avenue through the city’s financial centre admiring more of its impressive architecture. Enjoy this evening at leisure. A flight to the far west of the country delivers you to Cuiaba, your jumping off point for the extraordinary wetlands of the Pantanal. During your drive to the lodge, look out for various birds and animals and local settlements along the way. Arrive early afternoon where you will have an introduction to the region with maps and satellite imagery. Start your wilderness experience with a short walk to see some of the birds and animals which can be found close to the lodge. Early this evening savour a dinner of typical regional dishes including a tasty piranha broth. Declared a UNESCO Natural World Heritage site and Biosphere Reserve, the Pantanal is the largest floodplain in the world, covering an area of approximately 200,000 square kilometres. Its biodiversity includes more than 650 different species of birds, 262 species of fish, 1,100 butterfly species, 80 species of mammals, 50 reptile species and more than 1,700 species of plants. Alligators, capybara, mongoose, macaws, herons, baguaris, biguás, curicacas, mutts, parakeets, parrots, toucans and tuiuiús are an integral part of the Pantanal landscape which you hope to see on fascinating wilderness excursions. After breakfast, stride out on an eco-walk through wooded areas, forests and open fields in search of birds, mammals, reptiles, plants and other features of the Pantanal ecosystem. Later on snake your way along the winding Mutum River by boat keeping an eye out for giant otters, rays and shoals of small fish. On the banks, spot several species of birds in their natural habitat. After dinner, head out spotlighting by jeep or boat in search of the nocturnal creatures of this wetland environment. Explore the ecosystem from a different perspective this morning - on horseback. Follow a farm trail bordering Siá Mariana Bay keeping eyes peeled for flora and fauna along the way. In the afternoon, another boat ride scouring the river banks and channels for the many different species of birds, reptiles and other animals which are found here. Stop for sunset and a spot of piranha fishing and another nocturnal adventure after dinner tonight. Time permitting, paddle out early this morning on a sunrise canoe trip. Depart for Cuiabá airport and your flight to Salvador with its vibrant culture and beautiful colonial centre. Arrive at your chic Art Deco hotel, which is centrally located in the historic part of the city, with time to settle in before dinner at nearby Villa Bahia combining contemporary Bahian cuisine and French influence with the richness of local flavours. The first capital of Brazil, Salvador da Bahia, more commonly known as Salvador was a major centre for the slave trade and this UNESCO World Heritage site is now a thriving hub of Afro-Brazilian culture. Head out on foot this morning to explore Pelourinho, the old city. Admire the fantastic views over the Bay of All Saints, soak in the brightly coloured houses and stroll through the narrow, bustling cobblestoned streets and squares. Pop into the church of São Francisco to see the exuberant gold-leafed Baroque interior. Here in the rhythmic heart of Brazil find your own rhythm under the watchful eye of an expert percussionist during a private workshop. End the day as you watch an explosive and exhilarating traditional dance performance by the acclaimed Bahia Folklore Company. Start your day soaking up the local vibe in the bustling São Joaquim market, accompany a local chef and select the freshest ingredients for Bahia’s signature dish, the moqueca. Later watch as the dish is prepared in an earthenware pot and delivered to your table for lunch. You’ll also learn the secret to making a textbook caipirinha and sip a few before an afternoon at leisure. A flight south brings you to Iguazu Falls, one of the world’s greatest natural wonders and a UNESCO World Heritage site, located on the border between Brazil and Argentina. Settle into your grand hotel situated in an elegant Portuguese colonial building within the National Park, just a short stroll from the waterfalls, providing exclusive access when the crowds have left. Tonight, dine at your leisure in the hotel’s signature Ipê Grill. Discover the falls from the equally breathtaking Argentine side this morning. Take a small train through the park, wander along the walkways to the top of the falls and then head out to the suspended platform at the ‘Garganta do Diablo’ (Devil’s Throat), the largest of the waterfalls. Later journey by speed boat through canyons and along rapids for an up close and exhilarating view of Iguazu falls, Hear the thundering roar of the falls as they cascade down and be prepared to get wet (poncho provided)! Wander from the hotel down the canyon for a panoramic view of the Brazil side of the falls. Afterwards set off on a private behind-the-scenes experience at Parque das Aves, an internationally recognised rescue and conservation centre. Take an opportunity to have a look inside restricted areas and have the chance to handle and feed macaws, toucans, scarlet ibis and more. 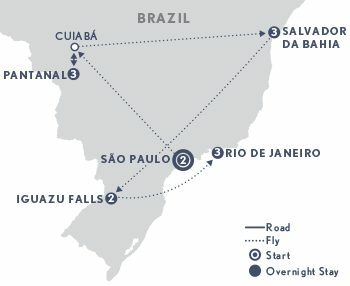 Continue to the airport for your flight to marvellous Rio and your elegant beachfront hotel. Later tick off Sugar Loaf peak, one of Rio’s most iconic landmarks, accessed via cable car. Enjoy sundowners and marvel at the breathtaking views from the top. Dinner tonight is a traditional Brazilian BBQ at one of the best churrascarias in town. Explore the city by bike this morning pedalling past the most important sites in the city’s south - Copacabana, Ipanema, Leblon and Rodrigo de Freitas Lagoon – and soaking up Rio’s vibrant beach lifestyle. Stop for a breather at the market and try some of the local exotic fruits. Later visit Favela Organica, a community project promoting sustainable consumption of healthy foods which are grown in small community gardens and share a memorable lunch here with the locals. This afternoon see Rio from the water on a sailing trip in Guanabara Bay past islands, forts and beaches with awe-inspiring views of the city, the lush green hills and the unmistakable silhouette of Sugarloaf Mountain. Look out for the futuristic Santiago Calatrava designed Museum of Tomorrow, the latest addition to the downtown skyline. Today venture into the foothills of the Tijuca National Forest by cog-wheel train up a steep incline to the summit of Corcovado Mountain crowned by the 30 metre high Statue of Christ the Redeemer, one of the Seven Wonders of the Modern World. From beneath Christ’s outstretched arms, soak up the extraordinary panorama of Rio’s mountains, rainforest and coastline. On the way back we pass through the bohemian Santa Teresa neighbourhood and visit a local artist’s studio. The afternoon is yours to relax at the hotel, do a spot of shopping or explore on your own. Tonight farewell new friends at a special dinner at award winning Guiseppe Grill. After breakfast, transfer to the airport for your onward journey. First group event: Welcome briefing at 6.00 pm on Day 1. Last group event: Farewell dinner at 7.00pm on Day 13.